OCPI version 2.2 expected soon! With the growth of OCPI as open standard, there’s also a growing need of information on the protocol. We are therefore proud to anounce the launch of the website ocpi-protocol.org. On this website you can find all you want to know about the open, independent protocol: news, latest developments, contributing projects and more. On this website, you can also download the complete specs of the latest OCPI-version and find more information on the OCPI Community. OCPI version 2.2 is expected by the end of january. It contains better support for roaming hubs, basic functionality for smart charging support and solved bugs from earlier versions. The improvements are due to the huge OCPI Community. Are you interested in joining? Everyone who signs the Contributor License Agreement (CLA) is welcome to participate. Download CLA and specs of current version 2.1.1. The cover story of the december edition of the scientific magazine ‘The World Electric Vehicle Journal’ focuses on OCPI. 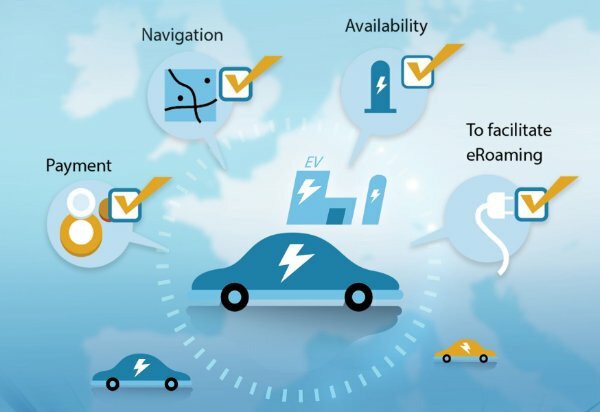 In this article, four Dutch experts on public charging infrastructure present their vision on the development of cross-border EV travel and describe best practices of e-roaming in the Netherlands. They translate lessons learned from internet and telecom to e-mobility and show how independent protocols such as OCPI will play a crucial role in moving towards an integrated EU-wide charging infrastructure. This december, Greenlots and ChargePoint anounced a roaming partnership that would enable charging between networks, opening access to thousands of additional charging locations throughout North America. The agreement is based on OCPI. Earlier in 2018, ChargePoint anounced similar collaborations with FLO and EVBox, effectively making OCPI the de-facto protocol for collaboration on that continent. ECISS is a Dutch project that aims to further develop roaming within the e-mobility sector and to establish a link with smart energy infrastructure and other services. In order to achieve this, ECISS is working on upgrades to OCPI. All information on this project is now to be found on a newly launched website. The site is in Dutch only. Share your news via the website! Allego, BeCharged, Blue Corner, Blue Current, BMW, Creos, Chargepoint, Easytrip (KiWhi), e-Clearing.net, ELECTRIC 55 CHARGING, E.ON, eMobility Consulting, Eneco, Enervalis, ENIO, EVBox, eViolin, EVNetNL, FLO, Freshmile, GIREVE, Greenflux, Greenlots, iHomer, Jedlix, Last Mile solutions, Movenience, Multi Tank Card, Next Charge/Go Electric, Next Green Car, Nuon, Open Charge Map, Open Fast Charge Alliance (Sodetrel, Fastned, Smatrics, Gronn Kontakt and Gotthard Fastcharge), Oplaadpalen.nl, Place to plug, Plugsurfing, Stromnetz Hamburg, The New Motion, Travelcard, XXIMO, and many others. OCPI has now been adopted and implemented by several EU energy and smart charging programs, including INVADE. The Netherlands Knowledge Platform for Charging Infrastructure (NKL) facilitates and coordinates this project to guarantee progress and ensure development and results. Would you like to stay informed? Subscribe to the OCPI update.